When combined with the global outlet that is the Internet, passion for our favorite movies and TV shows can inspire people to translate that passion into a thousand different, unexpected creations. We here at GFR regularly feature fan-created artwork and short films that can rival Hollywood when it comes to creativity and unique vision. But this one, this is one of those things where trying to figure out how they came up with the idea is enough to give a guy a headache. 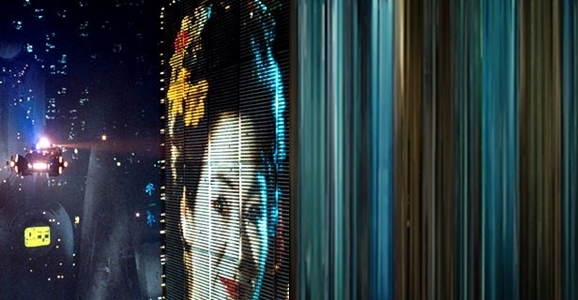 The left half of the image above is obviously pulled from Ridley Scott’s Blade Runner. But before we spoil the how or why, you’re just going to have to take our word for it when we tell you that the right half of the image? That’s Blade Runner too. That multi-colored barcode comes from the MovieBarcode Tumblr blog. It was created by taking frames from the film, squeezing them down into digital strips, and then assembling them in sequence to create…well, barcodes. And while these images don’t tell you much about the story or characters of your favorite films, they do simply demonstrate one visual quality of films that it sometimes overlooked: the color palate, and how it changes over the course of the movie. Knowing that and looking back at the Blade Runner image up top, it makes sense. You can see the film’s mixture of dark imagery peppered with bright neon flashes, a concise summary of the visual world Ridley Scott created. Compare that to another of Scott’s films, the Alien prequel Prometheus. The blues are a gimme if you remember the color tones of the scenes inside the Engineer base and aboard Shaw’s vessel. It’s harder to make sense of the patches of yellow and orange. Or we have the cotton-candy rainbow of Heavy Metal — appropriate enough for a movie based on a comic book. It’s easily the most brightly colored of the images we’re including here. And now that we know how this works, the image of The Matrix below makes perfect sense: a mixture primarily of black and green. The MovieBarcode Tumblr doesn’t limit itself only to single films. The image below traces the color palette of George Lucas’ entire original Star Wars trilogy. The desert colors of Tatooine give way to the black of space, then to the sharp blues of Hoth in the early sequences from The Empire Strikes Back, eventually interspersing the darker colors with the greens of Endor. It’s not the sort of thing I’d find myself poring over for hours on end, but the muticolored barcodes are a fascinating way to look back at some of your favorite movies, tracing the ways that color is crucial to establishing mood and tone, even when we’re only subconsciously noticing it. It also demonstrates how common certain color palettes are among filmmakers, especially blues and golds. If you find yourself craving a chance to hang an oddball visualization of your favorite movie over your fireplace, you can buy prints of many of them via RedBubble. Here’s a few more, just for fun.